Where did you grow up? How did your upbringing shape your ideas about being creative or owning a business? We moved around a bit when I was young. I was born in Duluth, Minnesota, spent early grade school in Des Moines, Iowa then moved to La Crosse, Wisconsin and stayed there until high school. We were encouraged as children to try lots of things— sports, music, theater, and art. I always loved making things. My brother was thought of as the “artist” of the family and always painted and drew, but I wanted to work with fabric and yarn. I saw a Reading Rainbow episode when I was maybe 3 or 4 where they read a book about a little girl who made a quilt with her grandmother with remnants of their clothing and I really really knew in that moment that I had to do things like that. No one in my immediate family sewed so I would eagerly wait to be with my aunt, the only one who could help me with my little projects. I would beg my mom for little sewing, crochet, or cross stitch kits. I didn’t even know what fiber arts meant until I was in college. But I had to make things. Every moment I got. It was like this world chose me. In high school, I took as many studio art classes as I could and gobbled up sewing, knitting, and illustration opportunities with so much enthusiasm that I eventually got permission from my art teacher to leave school during art class to walk to the nearby knitting shop so that they could teach me there. I ended up going to college for apparel design, but continued to have such a hunger for knits that I taught fiber arts for several years after college and slowly discovered my businesses during that time. When I first graduated from design school, I started teaching fiber arts full time. My specialties in teaching included crochet, knitting, design skills, incorporating sustainable practice into craft, and wearable art. I taught all ages—literally—from 18 month olds to 95 years. I loved teaching. I taught for places like Textile Center, Articulture, and the College of Design at the University of Minnesota. I was exposed to a vast array of techniques and skills and always wanted to learn more and experiment more myself. Because of this, I didn’t know how I would ever end up with one specific “product,” but I did want to start making and selling work. I started making very creative garments through a huge variety of techniques in 2009. I combined dye art, embroidery, knitting, crochet, hand sewing, machine sewing and more. Then I started to focus a bit more on dyeing upcycled garments because it fit well with my focus on sustainable design in my teaching. In 2013, I was invited to do some educational programming for the Goldstein Museum of Design for a show all about sustainable design. I LOVED this project. The gallery curators—Marilyn DeLong, Barbara Heinemann, Kathryn Reiley called their exhibit, Redefining Redesigning Fashion: Designs for Sustainability. During the exhibition we planned an event to educate adults on Sustainable Design in Apparel and brought in guests to teach different techniques and concepts. One of the instructors we brought in was Chiaki O’Brien, a SAORI weaving instructor. I was completely enamored by the concepts she taught and how free SAORI was as well as how easy it was to incorporate sustainable practice into the art. I asked her to give me private lessons as soon as the teaching project ended and I just couldn’t stop weaving once that started! How did your business, Mezamé Designs, come to be? When I first started weaving, I already had a small handmade business called “Little Ren Creations.” I labeled all of my weavings under that title for the first few years. I also created crocheted animal hats, which sold very well. The customer shopping my handwoven items was a bit different than the customer shopping my little animal hats, so I decided to rebrand my business as two separate labels in 2016 and then develop more products to strengthen the lines. This is when things really took off for my work. I started selling at a rate that I couldn’t keep up with as a side job to teaching. So I made the difficult decision in September 2018 to let teaching go for the time being. Things really got busy after that! I still have both handmade brands and love that I can switch back and forth! I now have many more types of wearable weavings in a broad price range and my other brand has developed into a sweet line of sustainable, diverse, and inclusive cloth dolls, in addition to the original animal hat design. In terms of the actual title—“Mezamé” is a word in Japanese for “awakening” and I chose this word to tie together the cultural origin of SAORI as well as my decision to use all sustainable materials in my weaving practice. Where does your connection to and passion for sustainability find its source? I was raised to be very thoughtful of the earth and others and to choose a career which would stimulate my mind and contribute to the greater good. I think that my parents weren’t so sure that Apparel Design would accomplish this at first, but they really know that this is not the case now! They love what I do!! We also grew up in a house on the bluff and in the woods, so I think a love of nature and the Earth was really fostered because of the natural beauty there. What does working in a zero-waste studio look like? What are the challenges? The pay-offs? Well it can get a bit messy around here, for one! Because I do not throw remnants and all of my odds and ends away, it’s a bit hard to organize. But that is okay! I collect yarn remnants from other makers and one benefit of having two separate product lines (Mezamé Designs and Little Ren Creations) is that I can explore all the more design ideas to use up odds and ends. 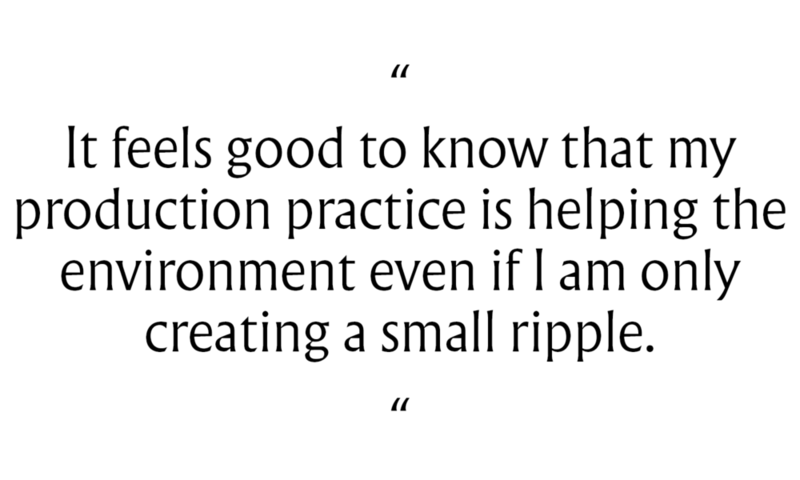 It feels good to know that my production practice is helping the environment even if I am only creating a small ripple. I hope that it has a larger effect! Using a combination of remnants and locally sourced fibers is great from a financial standpoint in that the remnants are less expensive and challenge me to work creatively and because I spend less on some of my materials, I am able to really invest in locally sourced materials also! I work with a few small yarn businesses who source wool on their own farms and then artfully dye and sell the wool after making it into yarn. One such company, Ewetopia in Viroqua, WI, has even dyed custom colored yarns for me! I LOVE working with other small businesses and I love it when selling my work benefits their work as well. How does living in Minnesota influence your creativity or the work that you do? Who (makers, community members, companies, etc.) inspires you? I really love how much opportunity there is here for makers! That helps inspire me a lot! The fact that it is often cool or cold here doesn’t hurt my ability to sell cozy handwoven shawls and other wearables either! What do you find interesting about SAORI hand weaving? How does it suit your creative approach and vision? I love that SAORI embodies free thought and self innovation. I love that one is encouraged to try new things all the time. The very first time I tried weaving—it was way too formulated for me. Often I felt that my creativity was constricted with sewing fabric designs as well. As I slowly discovered the fiber artist within my Apparel Design career direction, I was interested in pursuing freeform crochet but it took a very long time to create a single garment. Stumbling upon SAORI weaving not long after that was perfect. SAORI gave me a sustainable direction that I could take and stay with! In what ways do you allow risk or experimentation or play into your own daily practice? Every single day! The nature of SAORI is experimental. 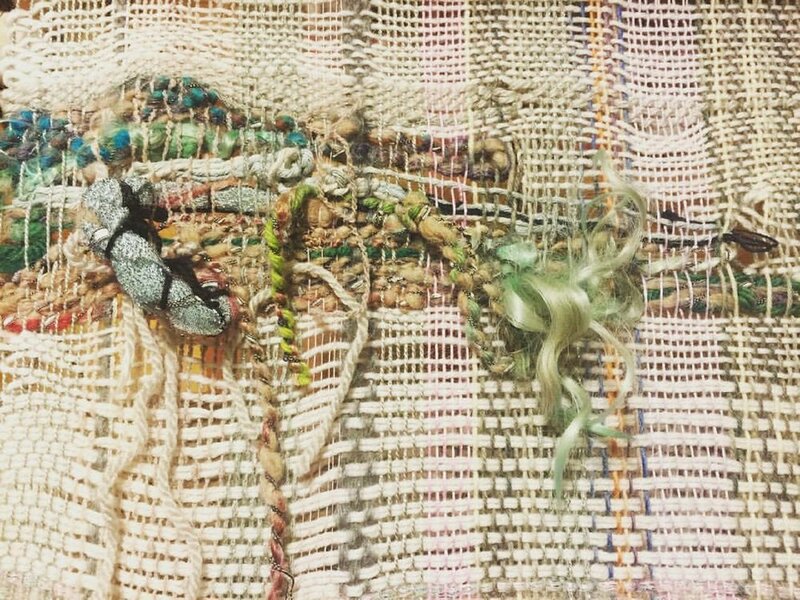 Now that I have set designs that I create, experimentation and risk is often played out in the details such as trying a different color juxtaposition within a free form weaving. Recently, I released many new designs in a much broader price range than my original pieces from small zero waste affirmation patches to full garments out of my woven cloth and that certainly included a lot of experimentation as I developed my ideas. On a much larger scale—applying to big shows certainly can feel like a risk! I remind myself that risk is the nature of my handwork so it is okay to try new things all the time! Could you talk about your own process and the development of your style? What are the most important elements of your designs? When I first started weaving, I was very excited to explore color in different ways. I wanted to create a large piece of fabric as soon as possible so that I could make a garment with it. I used natural colors in a unified but evolving palette. When I took the weaving off the loom, my instructor gasped in excitement! She told me that my piece seemed to have a soul and that I should not cut it. I was so excited to keep weaving! After some time, I started working hard to approach weaving in new ways each time but I quickly learned that the evolving palette and exploration of landscape scenes and complex evolving color palettes was my signature within weaving and that I should own it and love it! I still do! There’s so much to learn along a path like this. What advice could you pass along to someone who is struggling with their creative path that you wish someone had given to you? Sometimes I worried that what I really wanted to do was too specific. But it’s just the opposite really! The more specific your work or identity is, the louder you will be able to shout in today’s world! Do it! View more of Lauren’s work on her Etsy. Learn more about the American Craft Show in St. Paul at craftcouncil.org/stpaul.